Asia Cement Group opts for 13.7 km long BEUMER Group troughed belt conveyor in Sichuan, China: Through wild nature and populated regions. From the quarry to the cement plant: BEUMER Group built a 12.5 long conveyor through hilly terrain and unstable ground in the Chinese province of Sichuan. An additional, smooth running system is added with a length of 13.7 kilometres. This system can feed a potential third conveyor with limestone. Sichuan Yadong Cement Co, Ltd. in Pengzhou, China, has been relying on a 12.5 km overland conveyor from BEUMER Group in order to convey limestone from their quarry to their silo. When constructed in 2009 it was the longest belt conveying system in BEUMER history (BEUMER installed a longer system in 2016). The troughed belt conveyor runs through hilly terrain and nature reserves, over streams and unstable ground. The second project includes two additional overland conveyors, with an overall length of 13.7 kilometres, transporting limestone to the cement plant. Unlike the first project, the task here was to build the conveyor across inhabited areas. Noise emission limitations set forth by the government also needed to be considered. A traditional Chinese proverb says that the roads in Sichuan are hard, harder than climbing to heaven. Depending on the destination, there are rivers and valleys to be crossed and mountains to overcome. The southwestern Chinese province of Sichuan is the source of the majority of different ores in the country, such as titan, lithium and silver and plays a major role economically. The electronics, mechanical engineering, metallurgical, chemical, medical, food and building material industries are all pillars of the economy. One of the cement manufacturers in the region is Sichuan Yadong Cement Co, Ltd. located near Chengdu, the capital of Sichuan. The company is a member of the Asia Cement Group, headquartered in Taipeh, Taiwan. Whenever technically possible, the routing of the conveyor has been adapted to the topography. In 2004, the company decided to build a new cement plant in Sichuan. During the development phase, Asia Cement Group received approval from the Chinese government to use an abandoned railway to transport the limestone. Halfway through finishing the plant however, the government decided to build a new dam. The area intended for the transport was to be flooded, which would have changed the project conditions considerably: roads would be flooded and the trucks would have to take significant detours. Asia Cement Group was also planning on building two additional kiln lines at this location. 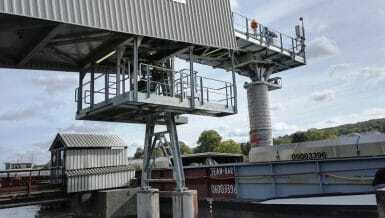 It was determined, as a time and cost efficient alternative, to install a troughed belt conveyor able to navigate horizontal and vertical curves. For this, the company turned to BEUMER Group. 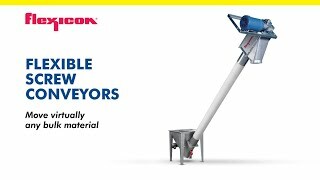 For many years now, Asia Cement has been relying on the system supplier’s expertise and are currently operating several of its bucket elevators. BEUMER Group took over the mechanical and electrical engineering and supplied the core components for the overland conveyor and monitored and commissioned its installation. The advantage: The Chinese subsidiary BEUMER Machinery Shanghai can be reached easily and deployed quickly to site. “Our colleagues were able to work closely with the customer. They know the specific local customs, speak the language and are familiar with the particular market and customer requirements,” reports Dr. Andreas Echelmeyer, Director of Conveying and Loading Systems at BEUMER Group. The troughed belt conveyor not only runs through rough terrain and over instable ground. In May 2006, Asia Cement Group awarded the contract for the 12.5 km long system. The overland conveyor can reach a mass flow of 1,500 tons per hour and a conveying speed of four meters per second. 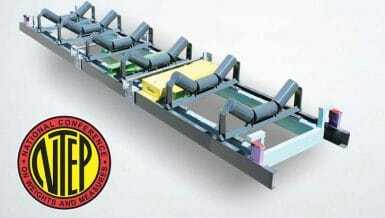 “Compared to other conveying solutions, the open troughed belt conveyors are suitable for higher throughputs. Horizontal as well as vertical curve radii are possible,” explains Dr. Echelmeyer. They can be adapted to the specific task and topography. Using BEUMER calculation programs, we can precisely calculate the static and dynamic tractive forces of the belt during the development phase of the system. This is a prerequisite for the safe dimensioning of horizontal curves. The type of drive technology and conveyor belts needed are based on these calculations. This ensures longevity of the entire system. The terrain is hilly and covered with dense bamboo forest, parts of which are listed as nature reserve. For this reason, the government did not approve a service route nor deforestation. The ground also presented a major challenge for the BEUMER Group engineers: “The ground is unstable due to previous coal mining. In other areas, the ground consists mostly of granite that could only be partially removed,” explains Dr. Echelmeyer. Another section of 1.5 kilometres had to be guided across a river. These framework conditions contributed to the fact that 90 percent of the system was installed manually on site. As it was impossible for trucks to transport the components, they were carried by mules, one part at a time, to the place of installation. The route of the overland conveyor was coordinated between BEUMER Group and the cement manufacturer. The system supplier calculated the tractive forces of the belt considering the eight horizontal curves with radii of 1,000 to 5,000 metres. The routing was checked for its feasibility on site. The complete route was checked by employees on foot, passing through rough terrain, in order to reliably check the predefined positions for the 460 supports for their suitability directly on site. Whenever technically possible, the routing of the conveyor was adapted to the topography. Height differences of up to 100 metres had to be overcome within shortest distances, so several sections were equipped with bridges of up to 55 metres. One section was realised with a 130 metre long tunnel. View of the enclosed conveyor flight in the area of the bridge. In close cooperation with the customer, BEUMER Group designed the overland conveyor and the bridges. The system supplier developed, built and supplied the core components for the drive and take-up station as well as the belt of an overall length of 25 kilometres, the idlers and the drive technology. Since February 2009, the overland conveyor has been transporting bulk material from the quarry to the bulk loading system. Since commissioning of the first section, the mass flow of the conveyor was increased in two steps. Today, the system conveys a mass flow of 2,200 tons per hour at a conveying speed of 4.5 metres per second. In July 2013, Asia Cement contracted BEUMER Group again for an additional, efficient overland conveyor to replace the trucks transporting the limestone from the bulk loading system to the cement plant. A mass flow of 2,200 tons of limestone per hour was necessary to meet the plant’s requirements. For this project, the first conveyor was to be customised to these requirements. “We were planning a second troughed belt conveyor with an overall length of 13.7 kilometres,” says Dr. Echelmeyer. This is the longest system in the history of BEUMER. For the whole project, BEUMER Group was able to ensure that the limestone is transported safely and quietly, without disturbing the residents or disrupting the surrounding nature. Projects of that size are often unpredictable, so flexibility was needed from the engineers. During the planning phase, the cement manufacturer acquired another plant in Lanfeng, approximately ten kilometres away. “Now we had to design the system so that both plants could be supplied with limestone,” explains Dr. Echelmeyer. The team had to divide the overland conveyor in two parts. After 5.4 kilometres, an additional conveyor can be added to be fed to Lanfeng in the future. In February 2015, the system supplier started with the installation of the conveyor frame. Both overland conveyors have four horizontal curves with radii of 1,200, 1,500 and 1,800 metres. “We provided the engineering and the individual parts such as pulleys, motors, drive and control technology and the entire automation,” describes Dr. Echelmeyer. The installation was monitored by a BEUMER Group supervisor and the wiring of the system was supported by a BEUMER electrical engineer. The system supplier was also in charge of the commissioning in May 2016. The troughed belt conveyor is now supplying three kiln lines, a fourth line is planned. The requirements were different for the two projects: the challenges for the first project were the hilly terrain, instable grounds and crossing through conservation areas and over waterways, for the second project the system had to be built crossing through populated areas. The Chinese government has set out exact regulations on the noise emission levels so that the residents would not be impacted. “We had to minimize the noise to an extremely low level,” describes Dr. Echelmeyer. The system supplier took several constructive measures in order to reduce the noise emissions. “We used noise-reducing idlers and customised protective covers on the drive stations,” explains Dr. Echelmeyer. In collaboration with the operator, BEUMER Group optimised the conveyor frame and the completely enclosed conveyor bridge. BEUMER Group is an international manufacturing leader in intralogistics in the fields of conveying, loading, palletising, packaging, sortation and distribution technology. BEUMER Group offers the right solution for almost every logistic challenge.